An article found on the King’s School website. Paddy opens a new boarding house to replace the one where he spent his all too brief time at King’s! 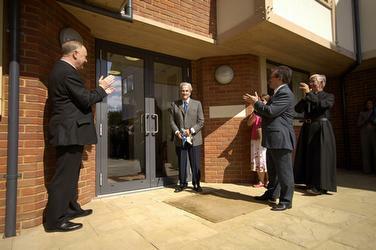 The New Grange was officially opened at 12.15 pm on Sunday 9 September by Sir Patrick Leigh Fermor DSO OBE. Sir Patrick was a boy in the original Grange from 1929 to 1931, shortly after it became an independent house in 1928. He unveiled a plaque with an appropriate Latin inscription*, and spoke of his early days in The Grange and the effect of the School and the Precincts on his upbringing. He then cut a ribbon to declare the house formally open. The house is next to Harvey House on the St Augustine’s site. It overlooks the ruins of St Augustine’s Abbey. This entry was posted in Paddy in the News and tagged King's School, Patrick Leigh Fermor on May 3, 2011 by proverbs6to10.